Tank Up Mug:There’s a certain etiquette to tea and coffee drinking - in a group situation, whenever one feels like a hot beverage, one is always obliged to ask others present whether they would like one as well – and quite frankly, it’s a pain in the... percolator. 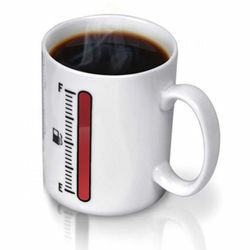 The Fuel Gauge Mug removes the need for that annoying social convention once and for all!Made from high-quality porcelain (and rather strikingly gift boxed), the Fuel Gauge Mug lets everyone around you know just how full your cup really is. It’s really very clever! Unlike a normal fuel tank which would require a float attached to a wire rod attached to a resistor, which is attached to... we shan’t go on - the designers decided to go for a much simpler solution – heat-sensitive printing!That means when the cup is full and hot, the gauge will show as full and as you guzzle your coffee down (or as the temperature of the contents is too cold to drink), your gauge corresponds to the contents current level until it goes down to empty. So you know, and so will others around you, exactly when it’s time to re-fuel.It’s a great gift for PA’s to give to their bosses – they’ll never have to interrupt a conversation again, just read the side of the mug and take appropriate action.With the Fuel Gauge Mug you’ll always know who’s running on empty – and be able to run away before they expect you to make them another one!Product Specification:Package dimensions: 13.5 (H) x 11 (W) x 9 (D) cm / 5.3 (H) x 4.3 (W) x 3.5 (D) inches.